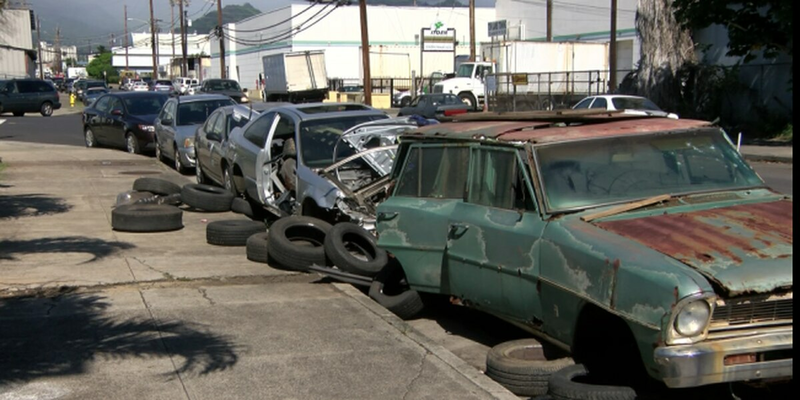 HONOLULU (HawaiiNewsNow) - For years, Puuhale Road in Kalihi has served as a graveyard for abandoned vehicles, but people who live and work there say it's never been this bad. About 40 derelict cars now line Puuhale Road and Auiki Street, which is about double the norm. Area businesses complain that the cars are not only an eyesore — but a health hazard. "Basically it's just a nonstop flow of abandoned vehicles," said Spencer Nash, general manager of Auto Word Specialists on Puuhale Road. "I'm just disappointed and saddened by the fact that our streets here are a drop off spot for abandoned vehicles." The city told Hawaii News Now that its inspectors will conduct an investigation and will take appropriate action. According to a city representative, the street is not designated as a temporary holding area for abandoned vehicles. Area businesses said tow trucks dump off the cars early in the morning before anyone can catch them. They say that the abandoned cars attract the homeless, who pile up their belongings and rubbish in the cars. "These cars give us hard time," said Aiea resident Keresente Ennet, who works in the area. "When we come in the morning, there's no more parking, but they know they're not supposed to do that." Environmental advocate Carroll Cox said the dumping problem has gotten worse recently because the large recycling businesses are buying fewer cars for scrap metal. Due to a worldwide glut, Cox says that the price of scrap metal has plunged, with no rebound in sight. "It's going to get worse before it gets better," Cox said. "So the city should aggressively pursuing whoever is doing this."